Are you familiar with the term “sensei?” It is the Japanese title for a revered teacher—a highly regarded or respected teacher. I met my sensei, Sonja Larsen, through an article she wrote in the April 1997 issue of Minnesota Horticulturist magazine (now named Northern Gardening). 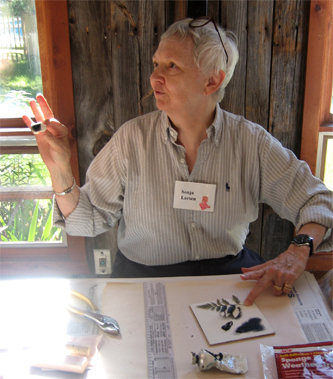 http://www.northerngardening.com/ Sonja wrote glowingly of the history of nature printing, selecting and pressing leaves, and how to print plants on paper and other surfaces. I didn’t know what nature printing was, but after reading the article, I was enthusiastic. Nature printing combined two of my favorite interests—the out-of-doors and artistic media—with the added allure that I didn’t need to be an illustrator to make appealing prints. I will always be grateful to Sonja Larsen for introducing me to nature printing, and for teaching me to print specimens from our yard, neighborhood, and travels. Thanks for asking about Twitter. I used to use it, got busy, & haven’t yet returned. You can see that even my blog posts are sporadic. For now, I will focus on blogging more often. If you live in the area of the Twin Cities—Minneapolis & St. Paul, MN—I will be teaching nature printing, and showing and selling work throughout the spring, summer, & fall. You can see a list of events & classes here the “About” page. Thanks again for your interest in nature printing.